The new black this fall: Retailers producing content alongside their products, like an online version of a glossy fashion magazine. Zappos expects to launch its first attempt at recreating the catalog experience on the iPad in early December, just in time for the holidays. The app was developed by the Zappos office located in San Francisco, where a dozen or so employees are working on building new shopping experiences. Zappos, which is owned by Amazon.com, is headquartered in Las Vegas. The new app joins the regular Zappos iPad app, which features most, if not all, of the products found on the company’s Web site. Instead of being generally available in iTunes, the Zappos app will be found on Apple’s Newsstand, which organizes magazine and newspaper subscriptions for those who use iOS 5. It will be free; a new edition will appear monthly. 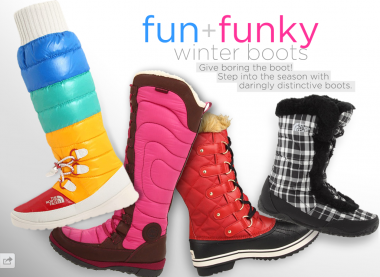 Articles will highlight things like fun and funky boots for winter or trends in color. All of the items will be for sale, making it more catalog than magazine. The app was unveiled to all Zappos employees at an all-hands meeting yesterday.